Tableau is a wonderful, powerful visualization tool. If you have the data, it will generate insightful, powerful dashboards and reports. But actually getting the data is often the tricky bit. And having it appear in your dashboards and reports without having to press lots of buttons is the goal. (No one likes to have to do a long series of cut and paste operations to get the data in place). Datamartist is a tool that lets you combine data from multiple sources, format it, clean it, organize it, and then make it ready for tools like Tableau. 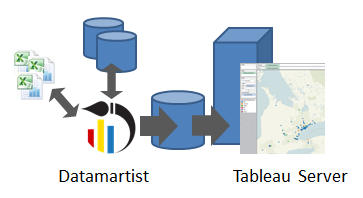 Because Datamartist can be automated from the command line, and commands on Tableau server can be run from the command line using tabcmd, it means that with Datamartist and tableau together, you can have a complete and automated reporting solution. Have you ever wished that you could update your Tableau dashboards automatically every day? Do you have non-database information in the form of spreadsheets that you need to integrate into your Tableau workbooks? With Datamartist and Tableau together, you can automate all these tasks, integrating formal database data with spreadsheet data from shared drives seamlessly, and quickly. And when your users log into Tableau, they see the dashboards they need to see. Datamartist lets you import data from Databases, excel files and text files, define data transformations that prepare and clean the data for visualization, and then export it to a location (very often a database, but potentially an Excel workbook or file) where it can be easily, automatically read by a visualization tool like Tableau server. You can learn more about what Datamartist does here. The first line runs Datamartist- this runs a .DMC file that you have built with datamartist that can extract the data from multiple sources- databases, files, internal hard coded sets- then do joins, segmentations, filters, calculations etc. and export the data to the location that the Tableau server workbooks are connected to. You can find more information about tableau's tabcmd on their site. Net result? You have full automation from data to visualization, Datamartist takes care of the data, Tableau creates fantastic dashboards. If you build a batch file, and set it to run once a day, every morning when your users log into Tableau server, they'll see updated data, ready to go. Try Datamartist- its a full function free trial. Find out easy it is to automate tableau server with sophisticated data extraction. Automatically generating Excel dashboards with graphs is a core feature of Datamartist it is possible to create multiple excel reports based on templates, inserting data from multiple sources.